Khao Yai fishing park sits in beautiful scenery 3km away from chaam and a short two hour road trip from Bangkok airport. Convenience, comfort, affordability and some of the hardest fighting fish you are ever likely to come into contact are at the heart of what khao yai offers. 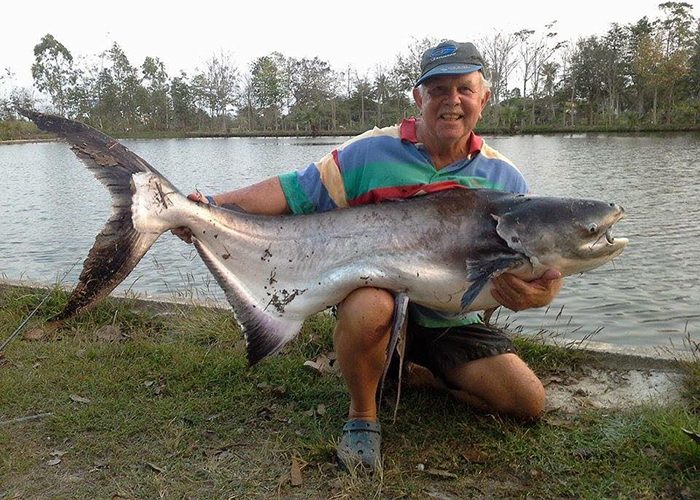 There is one main lake suitable for visitors, with siamese carp averaging 50lb, and mekong/chao prya catfish up to a huge 100lb are the main species. A better value fishery you will struggle to find. Hook a couple of these fish and you’re sure to need some refreshment. The on-site shop, with a healthy supply of sundry items coupled with a restaurant which has a small but tasty thai menu will keep your energy levels up. Elsewhere, locally you will find a renowned Wednesday night market which is more than 2km in length. You’ll find everything from locally sourced produce to clothes, sundry items and other fashionables. Chaam beach is also very popular with the indigenous people, due to its location and 5km of white sandy beaches. There is a wide range of accomodation on offer to suit all budgets nearby. Nightlife is adequate for those requiring a bar or some live music in the evening. For the more adventorous Hua Hin is a short taxi ride and offers a wider choice of nightlclubs. Package includes Rod Hire x 2, Tackle, Adequate allowance of Bait, Fishing Guide (Barry Gregory), Meal (Breakfast or Lunch), Soft drinks and local transfers from Cha Am £25 per angler per day. Interested in booking this fishing resort, please contact us via our enquiry form or contact our Head Guide Barry Gregory direct on +66 946740227. We can provide you with everything you need from start to finish to ensure you have an excellent trip.